ELP Laser Turntables promise zero wear to your vinyl albums! Laser turntables as a technology was news to me. I started investigating when my brother-in-law mentioned it over coffee today. He’s a techy guy and knows I’m a vinyl guy. Its an intriguing idea to read the grooves of a vinyl album with lasers rather than a diamond needle primarily to eliminate wear on the vinyl. The idea dates back to the early 70’s when William K. Heine did much of the development work on the idea and eventually received a patent in 1976. About ten years later Finial Technology was founded and managed to raise about $7 million in venture capital for the development of a laser turntable capable of playing standard vinyl LPs. 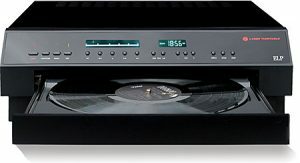 While some prototypes were developed and pricing was set at a rather prohibitive $3,800, the perfect storm of a recession and the launch of CD with CD players going for $300 assured that this laser player never saw commercial production. 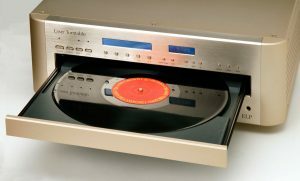 The only commercially available laser turntable initially was the ELP LT-1XA which was first sold in 1987 for $20,500. It was developed by the Japanese company BSR. Because of the use of lasers, these turntables can only play black vinyl – not a huge shortcoming. By 2004 there were “three different models; the LT-1LRC (RC for remote control) plays back at 33 and 45 for $10,500, the LT-1XRC will also do 78’s for $13,300, and the LT-2XRC adds the ability to play any size record for $14,300.” (Audiolics Anonymous Chapter 55 (2004). From what I’ve read, the advantages of these turntables are no wear on your vinyl, no or very minimal external distortion from the motor of the turntable itself or your speakers and a unique ability to focus the laser on the best (i.e., undamaged) area of the groove. Laser turntables also have some CD functionality in their ability to pause, repeat tracks and full album sides and scan forward and backwards to play specific tracks. Cost has to be one of the downsides to an ELP. I know many audiophiles put out tens of thousands for their turntables and all the components, but these units are still pricey. There is a unit currently available on Ebay for $9,500 USD that was reportedly originally owned by Frank Sinatra Jr. In addition, the reviews I’ve read all indicate a flatness or dullness to the sound reproduction. A final major disadvantage is the fact that the lasers read everything in their path – including every speck of dust and dirt. Yes, dust and dirt impact on a standard stylus, but there is some element of a standard stylus pushing microscopic particles out of the way. The laser does not do this. The ELP is only available directly from ELP in Japan and this is the only source for parts and repairs. ELP does use a European distributor, but you are still technically buying directly from ELP. The picture above is from the ELP web site. The one to the left exists on a number of unrelated review sites on-line, but I have been unable to find the seemingly more up-to-date model via any official ELP publication. Some more info for inquiring minds. You can also find ELP on Facebook – They had a Fathers’ Day free shipping special that my kids sadly missed.